I’m currently busy with a post series on how to plan a novel, and last week I told you how I plan my main characters. Now while a main character is one of the fundamental parts of writing a novel it isn’t a story on its own. You can have a character and still have no clue what this character is supposed to do. Today I want to fix that, I want to help you figure out what should happen in your story. Because we already have a character we’ll start with that. The first thing you want to know is what your character wants and why they want it. So based of what you know so far ask yourself these three questions. 1. What was your character’s past like? 2. How do they feel about it? 3. What is your character’s plan’s for the future? Knowing what your character wants and why is important because it not only reveals character but also gives you a start to a story. It shows your reader where they can expect it to go. A goal is only a goal if your character is taking steps to achieving it. Now the thing is you need to turn that want into a goal for your character. This means that there needs to be steps taken towards it because without the steps toward it it’s just a dream and completely useless. Hardly ever does a character’s plan work though. There has to be something that stands in your character’s way. The things that stand in your character’s way can be embodied in a person (the villain), it can simply be the circumstances or it can be a part of the character self. The best thing to do is make it a mix of all three. Just remember that a story is the push and pulls between two or more forces, it is tension and struggle. Not an easy victory. Make life for your character hard and put obstacles in their way. Occasionally the things that are put in your character’s way can change their goal. Normally this is at points in your novel such as the inciting incident, midpoint climax and occasionally the climax itself. This happens because a lot of the times characters finds out new information that changes everything for them. 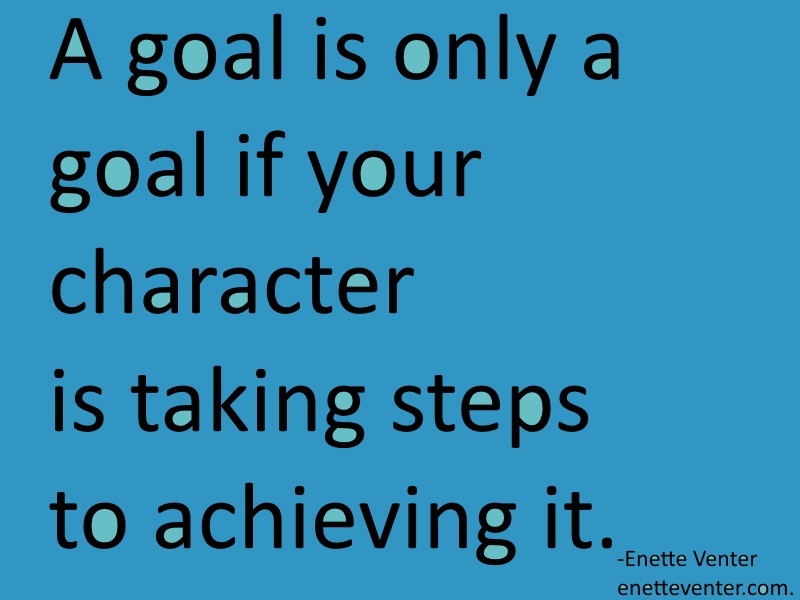 For whatever reason your character changes goals just remember to make your character takes steps to achieving this goal and putting something in their way. So now you might have a basic idea of what is going to happen in your story now put it on paper. Write a paragraph that explains what will happen in your story. Give it a beginning middle and end. It doesn’t matter if you don’t know everything yet because if you did you would be writing your novel right now. So instead just write down what you do know and see where that leads you. I hope that this post about goals where useful to you and that you would come back next week when I write about the other half of the story, the villain. I am working on a book right now and I found all of these helpful tips. That’s great. Characters are really one of my favourate part of writing because it is who you want your reader to connect with.